Disclaimer: I am speaking as a queer person of colour but from a privileged white-passing, straight-passing, cis, able-bodied perspective. I would also like to acknowledge that people of colour, lgbttq*, and queer are not meant to essentialize the people within these categories but are used to label groups who have some similar experiences. I also use queer as an umbrella term for lgbttq* folks but realize that not everyone identifies with this word. It’s been just over a month now since Fame Nightclub posted two offensive, racist, photos on Facebook. The response from people of colour and allies was instant and a petition was started to request an apology. It is now December and feels as though this issue is fading away without any sense of remorse from Fame or justice for people of colour. Living in Winnipeg as an lgbttq* individual can be hard; for people of colour in this community it can be even harder. People of colour have to deal with silencing, cultural appropriation, micro-aggressions, and violence from the general public but also within feminist and queer circles. Lgbttq* folks deal with overt and covert forms of racism constantly, even from people who advocate for marginalized groups. On November 9th a group of community organizers and activists, including Mexico, met to discuss the next steps of dealing with the issue. They started the online petition the next day, November 10th, to request an apology from Fame. Everyone is encouraged to sign it and show their support for people of colour who feel unwelcome and unsafe going to Fame. That same day CBC News published an article with a video clip taken at the action meeting. Outrage grew with the story of Brittany Hildebrand, a Fame employee who was fired and banned for speaking out about the issue. Many others have also been banned from Fame and unfriended on Facebook for speaking out about the issue. Now, a month later, the petition has received 250 signatures out of the 1000 mark goal. Despite only reaching 25% of the goal so far we must consider the 250 people who have signed in support. We must consider the people who have been offended and are left to feel unsafe. We must consider establishments’ claims of inclusion and how this contradicts their actions. We must consider the not-so-diverse-happy-go-lucky-vibrant-rainbow-flag that is meant to represent “us” but instead connotes gay white capitalism. We must consider the exclusion lgbttq* people of colour face for their double+ minority identities. We must consider this a deliberate repetitive cycle of maintaining white supremacy. The image to the left is a hierarchical representation of oppression. This pyramid shows how minor acts of subtle bias turn into acts of violence. People might take part in acts of subtle bias like stereotyping people of colour, but not consider themselves to be racist. Unfortunately, accepting minor forms of oppression inadvertently perpetuates prejudice, bigotry, discrimination, violence, and genocide. 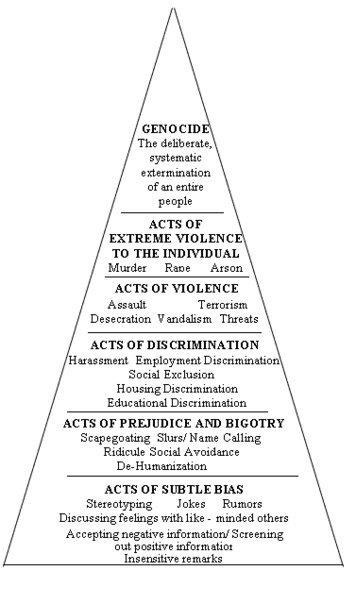 Through the use of this pyramid, it is easy to tell why many people of colour feel unsafe going to Fame Nightclub. Halloween costumes have political implications that mean more than dressing up. Even if it was unintentional dressing in blackface means more than wanting to look like Bob Marley. This is explained in more detail in Sane Dube’s November 13th article. Blackface is deeply racist and by allowing this person into their establishment, uploading their photo on social media, silencing people who speak about it, and releasing a statement instead of releasing an apology, Fame is showing that they are at the level of “acts of discrimination.” This shows people of colour, especially black people, that violence is only one step away. How then, does Fame Nightclub claim to be “inclusive not exclusive” and “provide a positive, non-judgemental and safe place for the community and its allies to have fun?.” Who is it actually fun for? Who is it actually safe for? Who is included? Many queers call Fame a gay bar or even a straight bar; this distinction is primarily because it is not an inclusive space for people who see themselves on the lgbttq* spectrum. Fame is also not wheelchair accessible; there are several steps and no elevator which makes it impossible for people with mobility issues to attend. For years people have felt unhappy with Fame Nightclub. The sad reality of being queer in Winnipeg is that many of us continue to attend venues that we feel uncomfortable with because we feel we don’t have other options. I spoke with Seran Gee, a Winnipeg-raised community organizer now in Toronto for their PhD, about this issue. Gee helped organize a boycott of Fame in response to their 2012 New Years Eve Bollywood Party. The boycott was organized by the QPOCalypse collective (no longer active) who had 80 people pledge not to return to Fame until an apology was released, but that never happened. Gee explains, “we chose this action, rather than something more direct, because of limited resources mostly. It was a good way for us to make our position known, and to bring attention to the potential harms the event could inflict on people of colour via problematic representations.” Fame’s December 2012 album includes culturally appropriative photos of white people belly dancing at the New Years Eve party. Problems with representation arise out of not knowing or not respecting the difference between cultural appreciation and cultural appropriation. Several efforts are made by people to ensure their culture will not be made into a costume but these are either unseen, misunderstood, or ignored. Every year money is poured into campaigns to raise people’s consciousness about appropriate costumes yet it continues to happen. So what is the correct action to take? Despite the petition’s failure to motivate an apology thus far, signing it, for those who haven’t, is still a great step to take. There is strength in numbers and it can show support to the people who have been personally impacted by Fame. But what if Fame never apologizes? Uzoma Chioma, the founder of Winnipeg’s new (May 2014) group, QPOC Winnipeg believes that “every business can do things to improve; it’s a matter of whether or not they’re open to growth.” Given Fame’s financial success and ability to attract people every weekend, taking responsibility and being accountable for these racist incidents are unlikely. Seran Gee believes that Fame is a lost cause for many reasons but this nightclub will continue to operate. The appropriate step, Gee believes, is to nurture the community’s potential by “creating a space that is safe and accessible.” Chioma notes that she doesn’t believe any space can be totally safe but that “recognizing the needs of those you’re trying to serve and ensuring that they have a voice in how that space comes together” builds a safer space. Chioma created QPOC Winnipeg to serve as a safer space for people of colour. She said, “I’d had several conversations with queer people of colour, about the lack of diverse, lgbttq* safer spaces in the city. I was frustrated with the limited options for something as simple as a Saturday night out dancing. I knew that there was a need for these spaces and for supports, resources, specifically for queer people of colour and allies.” QPOC Winnipeg has now had three dance parties and also organizes a Ladies Night at The Tallest Poppy. The next one will be on December 6th. Chioma says that a number of organizations in the city including Queerview, Wpg Dyke March, and Pride Winnipeg, are supportive of the need for safer spaces for lgbttq* people of colour. Spaces for queer people of colour only are necessary, as are spaces for queer people of colour and allies. It can be difficult for minorities in Winnipeg to find venues they feel comfortable in. Mexico says that when planning events or choosing where to DJ, a venue’s reputation is important. Reputation, he says, includes “how the venue deals with issues, problems, etc… Everyone makes mistakes, it’s how they are dealt with and addressed that can speak volumes.” Fame might have been able to redeem themselves had they taken the appropriate steps. But now, a month later, even if they decide to take action, it will take more than an apology to rebuild trust. It seems that we have reached a point of no return. Fame has offended people countless times and this can no longer be ignored. We have to realize that Fame is not going to apologize and as a community interested in creating safer spaces for people of colour, we must question what our next steps will be. I think our time would be better spent fostering positive, inclusive, environments like QPOC Winnipeg does. Safer spaces for lgbttq* people of colour means resisting white supremacy and heteronormativity all at once. It means reclaiming spaces that people of colour might not feel safe or welcome going to alone. People of colour are valuable to the queer community and we should not feel alienated and powerless. I am filled with rage at the fact that white people distance themselves from this problem. I am tired of being and seeing people of colour in the shadows of white queers whose only political agenda is liberating other white folk from sexual oppression. Look outside of yourself. We are not all the same. We have different needs. Ask yourself questions. What are you doing to dismantle white supremacy? Are the events you are hosting inclusive? How can you improve? What barriers might you remove and what supports might you add to be more welcoming? On December 4th Rainbow Resource Centre is hosting “A Discussion About Racism in Our LGBTTQ* Communities” and attending would be a great step to take. If you are unable to attend it is still important to start thinking and talking about racism lgbttq* people face. Fame’s actions reflect underlying racism in Winnipeg. We have to hold each other accountable and work to create safer spaces because we are all responsible to make our communities more inclusive. Published by the University of Winnipeg Institute for Women’s and Gender Studies.